The much talked about new Class 1 raceboat, built by Italian Boat Builder, Nicolini Offshore, the NO C1CAT - the first new design in Class 1 for five years - was unveiled at this weekend's Russian Grand Prix, in the colours of the Qatar Team and Qatar 9 was given the immediate 'thumbs up' by the man behind the project, Matteo Nicolini. "The first shakedown test was done by me on Friday and the feeling and balance of the boat was immediately very good, the handling in the turns and in the wake of other boats was also good," said Nicolini. "I am very happy with the work, the overall build and rigging done by my team." "From the moment the boat was running in practice and Pole Position we had no problems. Remember this is a completely new boat and from the start has showed good performance. And with Mohammed, who has not had much time in a Class 1 and with Luca, also in this boat for the first time, they were running only six seconds off our pace which shows that the boat has great potential." "This project which I undertake uses all my experience of the last four years running the fantastic Michael Peters-designed Victory hull, but with several key hydrodynamic and aerodynamic modifications. The deck and hull design is different. The area behind the canopy is smaller and stronger where we added weight. The side profile is lower, the deck is more curved and the tunnel is wider by 100mm and we also changed the angle of the sponsons." "Although we will run the same engines, transmission and rudder configuration, the modifications that I have made are done to suit the type of courses that we are now running in Class 1 where acceleration and speed in the turns is now crucial. This boat is specifically designed to give better acceleration and to be fast in the turns." 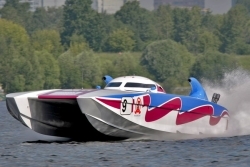 Qatar 9's first outing in Friday's practice on Moscow's Khimki Reservoir showed the boat's potential, clocking a time just eight seconds off the fastest time set by Qatar 96, and in qualifying in the Edox Pole Position, Mohammed Al Nassr and Luca Nicolini posted the sixth fastest time, 10 seconds off the pace of Victory 1, but just six seconds of Abdullah Al-Sulaiti and Matteo Nicolini in Qatar 95. However, any hopes of a successful race debut were abruptly ended with a broken propeller on lap one.